My father was the eldest of four children and his family lived in Barrackpore, about 20 kms out of Calcutta. My grandfather was a race-horse trainer. When his horses won, it wasn't unusual for their owners to present him with all kinds of gifts. Sweets, fabrics, jewellery, even cars. When my father was about seven or eight years old, they were given a tiger cub. This was in the 1920's and tiger shooting was rife. A friend of my grandfather's had been out hunting, shot a tiger and then found that she had two cubs. I've read since that it was not uncommon for the cubs to be shot as well. In this case, they were brought back to the city and domesticated. My grandfather raised the cub and it became his constant companion around the house. My father told me that he and his brothers would ride their bicycles to school every day and they would return around the same time. The tiger had an afternoon ritual where it would wait in ambush in the long grass near the gates, and as they raced in towards the house, it would pounce and knock one of them off their bike to wrestle and play. When the tiger was around two years old, it became clear that a domestic home, even with large gardens, was not the place to keep this creature. It would certainly have been an intimidating size. My grandfather had been getting complaints from various people, and finally decided that the tiger could not stay there. He donated the tiger to the Calcutta Zoological Gardens in Alipore. My father said that my grandfather would go to the Zoo at the same time every day and that the tiger would call out to greet him. As a a child, I insisted my father tell me this story over and over repeatedly. It seemed so incredulous to me that anyone could own a tiger as you would a dog or cat. I always felt so sad and worried for this tiger's fate. Taken from it's dead mother, deposited in a family home where it lived only with relative freedom for two years, and finally imprisoned in a concrete cage for the remainder of its life in a zoo. In 2007, I met with the Assistant Director of Alipore Zoo with the hope of finding some shred of information about this tiger. He told me that most of the records held in the Zoo were lost around World War II, and that during this time, the animals were evacuated to private estates outside of the city. I'm not even sure what I was looking for. Its name perhaps, or how long it lived. Last week, I did in fact find some references to Zoological Reports held at the National Library from this period. I may discover something yet. This is one of the threads to my project, and although I'm not making a narrative work about this tiger, it has certainly been in the background of much of my thinking. There is also something very tangible about being here in Calcutta that makes another strange kind of connection. 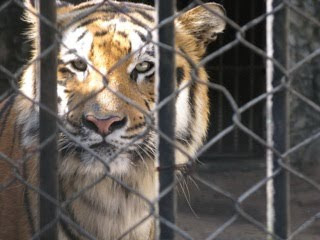 Visiting the zoo, seeing those tigers living in perhaps the very same cages that my grandfather's one lived. I am aware that this now is a different time, a different place and that what I am looking for no longer exists. It is simply another fiction. I suppose I just want some trace of that history, some physical evidence, even just a word.